A vegetable garden (also known as a vegetable patch or vegetable plot) is a garden that exists to grow vegetables and other plants useful for human consumption, in contrast to a flower garden that exists for aesthetic purposes. 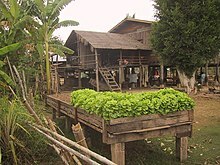 It is a small-scale form of vegetable growing. A vegetable garden typically includes a compost heap, and several plots or divided areas of land, intended to grow one or two types of plant in each plot. Plots may also be divided into rows with an assortment of vegetables grown in the different rows. It is usually located to the rear of a property in the back garden or back yard. About a third of adults in the UK and America grow food in private or community kitchen or vegetable gardens. In World War II, many people had a "victory garden" which provided food and thus freed resources for the war effort. With worsening economic conditions and increased interest in organic and sustainable living, many people are turning to vegetable gardening as a supplement to their family's diet. Food grown in the back yard consumes little if any fuel for shipping or maintenance, and the grower can be sure of what exactly was used to grow it. Organic horticulture, or organic gardening, has become increasingly popular for the modern home gardener. The herb garden is often a separate space in the garden, devoted to growing a specific group of plants known as herbs. These gardens may be informal patches of plants, or they may be carefully designed, even to the point of arranging and clipping the plants to form specific patterns, as in a knot garden. Herb gardens may be purely functional or they may include a blend of functional and ornamental plants. The herbs are usually used to flavour food in cooking, though they may also be used in other ways, such as discouraging pests, providing pleasant scents, or serving medicinal purposes (such as a physic garden), among others. A kitchen garden can be created by planting different herbs in pots or containers, with the added benefit of mobility. Although not all herbs thrive in pots or containers, some herbs do better than others. Mint, a fragrant yet invasive herb, is an example of an herb that is advisable to keep in a container or it will take over the whole garden. Herbs used for other purposes: stevia for sweetening, feverfew for pest control in the garden. ^ Scots "kailyaird" or "kailyard", means a small cabbage patch (see kale) or kitchen garden, usually adjacent to a cottage.--Cuddon, J. A. (1977) A Dictionary of Literary Terms. London: André Deutsch; p. 343. ^ a b Titmarsh, Alan (26 January 2014). "Grow your veggies in style! How to create a kitchen garden". The Express. Retrieved 9 May 2017. ^ Hendry, Ann Marie. "How to Design a Potager Garden". growveg.co.uk. Retrieved 9 May 2017. ^ a b Komar, Stephen (7 May 2017). "Some tips as you prepare your spring vegetable garden". New Jersey Herald. njherald.com. Retrieved 9 May 2017. ^ "Planning a vegetable garden". 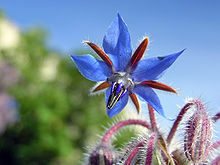 rhs.org.uk. Retrieved 9 May 2017. ^ "'Rising numbers' growing own food". May 17, 2012 – via www.bbc.co.uk. ^ "Gardening Boom: 1 in 3 American Households Grow Food". Farmer Foodshare. ^ Pack, Charles Lathrop (1919). War Gardens Victorious. J. B. Lippincott. p. 15. ^ Buckland, Toby. "The beginner's guide to starting a veg garden". The Telegraph. Retrieved 9 May 2017. ^ "Mint and the Home Vegetable Garden". VegetableGardenHub.com. Retrieved 2012-05-19. Bartley, Jennifer R. (2006). Designing the New Kitchen Garden: An American Potager Handbook. Portland: Timber Press. ISBN 978-0-88192-772-6. Davies, Jennifer (1987). The Victorian Kitchen Garden. London: BBC Books. ISBN 978-0-563-20442-8. M. D. (1901) "Formation of the Fruit and Kitchen Garden", in: Thompson, Robert The Gardener's Assistant; new edition, revised ... under the direction and general editorship of William Watson. Vol. IV, pp. 1–32. London: Gresham Publishing Company. Shewell-Cooper, W. E. (1947) The A.B.C. of Vegetable Gardening London: English Universities Press (first published 1937). Wilson, C. A. (ed.) (1998). The Country House Kitchen Garden 1600-1950: How Produce Was Grown and How it Was Used. Sutton Publishing. ISBN 978-0-7509-1423-9.